The earliest references to anyone with a name resembling Gisby in the East Kent area are found in the Church of St James in Birchington, where there are records dating back to the mid-seventeenth century of Gisbornes and Gisbournes, people who are most likely to have had their origins in France. 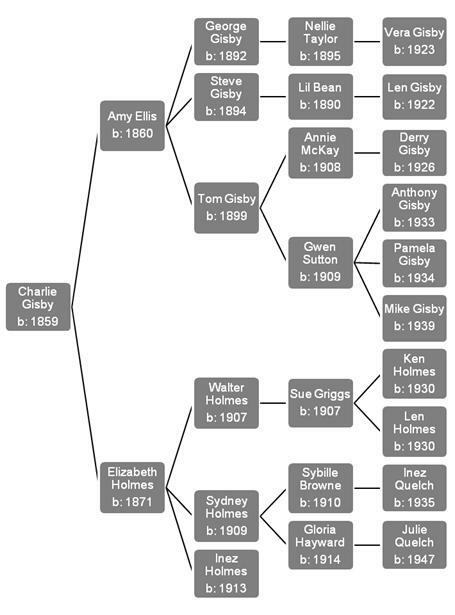 Using those records as a starting point, Phil Gisby has been constructing a comprehensive family tree for the East Kent Gisbys, which can be viewed on his website The GISBY Family Tree. In the course of his research, Phil has discovered records, some from as early as the sixteenth century, of other Gisby families not only elsewhere in Kent, but also in other parts of England, the west of Scotland, the USA, Canada and New Zealand. It would seem, therefore, that, although there aren’t that many of us about, our much misspelt and much mispronounced surname crops up all over the place! This saga has focused on one small branch of the East Kent Gisby family tree, the one begun in Margate in 1859 by our great-grandfather, Charlie Gisby. The entire cast of the saga is shown in the following illustration of Charlie’s branch. His five sons provided him with ten grandchildren, most of whom were born before he died in 1938. Including his grandchildren, great-grandchildren and great-great-grandchildren, we estimate that today there are more than fifty descendants of Charlie spread across the UK and the USA. In the stories that make up the saga, there is a marked absence of silver spoons and of privilege of any kind. Charlie and his five sons were what the chattering classes of today might call “ordinary people”. But in our view they were much more than that. None of them, not even the wily Sydney, was afraid to work hard for a living. When he wrote of the “humble people who expect nothing” on Margate Sands back in 1921, T. S. Eliot could easily have been describing Charlie or any one the Gisby boys. Nor were any of them afraid to face danger in the defence of their country. Whether it was as a member of the Home Guard, a soldier on the front-line, a sailor patrolling the North Atlantic or a fireman on the home front, each of them in his own way was a true working-class hero. In fact, their exploits have helped us to change our outlook on the surname of Gisby; we no longer see it as an embarrassing oddity in our lives, but as an important part of our heritage, something to be proud of. Set aside that new-found pride in our surname, we also have a few regrets in coming to the end of the saga. We’re sorry that we haven’t been able to fill in the details of George Gisby’s story between the years 1923, when his daughter, Vera, was born, and 1949, when he died. We’re also sorry that we don’t have sufficient information on Charlie’s only daughter, Inez Holmes, to include her story in the saga. More could emerge in the future if contact is ever established with descendants of George and Inez, at which time a revised version of the saga might be produced. I was contacted by Tara (a daughter of Inez in Amarillo, Texas) during the summer of 2010 via Facebook, following e-mail exchanges with Charlene (another daughter) some years earlier which had dried up. Tara's opening gambit was along the lines of: “Are you the same Phil Gisby Charlene had contact with some years ago regarding their grandfather?” The only other Phil Gisby I know of is in New Zealand!!! The reason for this stemmed from many years of effort by the daughters of Inez to try and track down her sister Julie after they had lost contact in the mid-1960's, when Inez finally settled in America. The four daughters of Inez involved with this are Julia, Charlene, Donna & Tara. With help from one or two others I have contact with, what seemed impossible was achieved when the missing sister was located. She'd married twice - but had always remained in the Oxford area. I feel a huge amount of luck came into this. Once a likely name, address and phone number had been unearthed Charlene took a chance and made a phone call - before we had convinced ourselves we'd actually found the right person. The rest (to borrow a cliché) is now history. Apart from the obvious motivation to make a UK trip (on behalf of their mum) to meet various people face-to-face e.g. Aunt Julie and her family, yours truly, Ken Holmes, et al - there was one other major issue. Inez knew her mum Sybille was buried in Margate cemetery, but had never had the chance to visit it. As a suicide (and Catholic), her grave could have no headstone or markings. Presumably that also meant no normal ceremony either. Once again my research skills were called upon, but this was a much easier one to solve. The net result of the August 2011 trip meant the ladies met loads of new-found relations, visited English towns where some of them were born, did a London West End show (Phantom of the Opera) and other famous sites, and visited the grave of their grandmother to erect a plaque and lay flowers. A hugely successful outcome.